Being Irish I have something of a potato obsession. I remember they were one of the first things that my mother taught me how to grow. She plants them in all sorts of old junk. She delights in using worn-out buckets with holes in, rusty 5 gallon oil drums, treadless tires, which she piles up on top of one another and then fills with soil and cow manure from the farm next door. It all lends a very quirky element to her garden design that may not win her many plaudits from the style police, but what the heck! It's fun! It's great to see life sprouting out of stuff that other people throw away. And once you've harvested your first crop you'll understand what's so infectious about the whole potato-growing business. ... and left them to bud on an indoor window ledge. Old egg boxes make great holders for your seed potatoes whilst you're waiting for the buds to develop. Just take them out of the bag they've come in and place them in a dry sunny spot. Always position the eyes - the bits from which the shoots will grow - facing upwards. Now you need to choose the container that's going to be your potato plot. Choose a big one that allows enough space for your tubers to grow. The one pictured below is an old campaigner that's seen lots of action in a more prominent position on my patio. 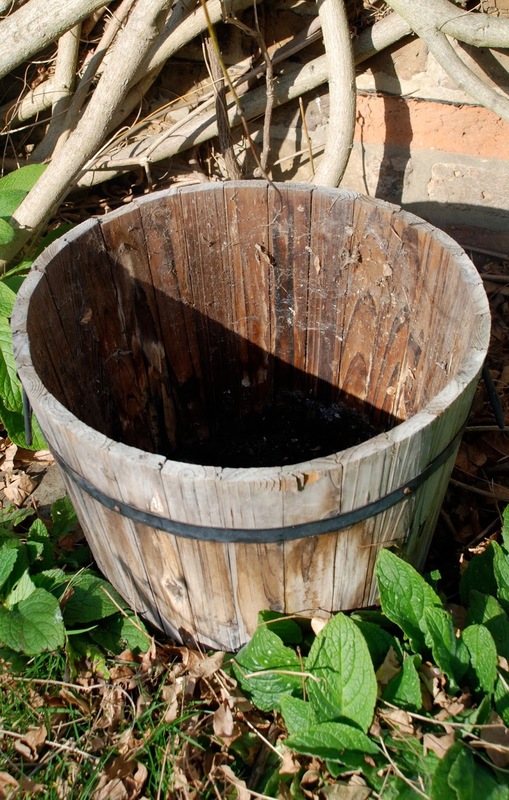 It has a 16"/ 40 cm diameter and stands 12'/ 30 cm tall, and I'm only going to plant one tuber in it. That way the potatoes will grow larger. As a rule each plant will need about 2.5 gallons/10 litres of soil. If you scrimp on your potato/ soil ratio you'll just end up with smaller potatoes. Now put a layer of 3"/ 7.5 cm of organic composted manure on top of the stones, and then cover that with a couple of inches/ 5 cm of organic compost. On top of this place a seed potato with the shoot facing skywards. Then cover it over with compost, being careful not to damage the shoot. On top pile on another 5"/ 13 cm of compost, and then water your soon-to-be bountiful potato garden. All you have to do now is leave Mother Nature to work her magic, and come June/ July the container will be full of delicious potatoes. Watch over it carefully between now and then, watering it if it's in danger of drying out, and abracadabra - that's just about all there is to it! Some people add fertiliser, but I find that the composted manure is rich enough to keep the tubers growing. You can also top up with more soil as the plant grows to encourage it to grow tubers all the way to the top. These potatoes will be ready to harvest early in the summer. As a result there's no need to worry about the dreaded potato blight, which tends to arrive later in the season. It's a great project to get your little people involved in. My son, Emi, gets really excited about growing potatoes. He really, genuinely believes that old Mother Nature is magic. And you know what? The kid's not wrong!